Postcards from the end of the world. 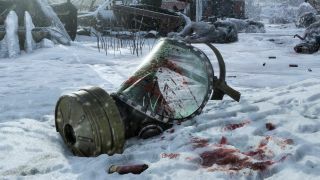 In Metro Exodus, released today, Artyom leaves the Moscow Metro behind and embarks on a journey across Russia aboard a steam train, the Aurora, to look for a better life. It's a dramatic change of scenery, even if, as you can read in my review, nothing much has changed in terms of combat and survival. The first stop on your voyage is the Volga River, and here's a screenshot diary of some of the stuff I discovered as I explored its icy, irradiated wastes. This is the first big, open map in Exodus, set around the banks of the River Volga. It's a freezing expanse of dead forests, sunken villages, and abandoned industrial complexes, and crawling with all manner of vicious mutants. Artyom's primary goal is finding a way to repair the Aurora, but there are other things to discover out here, including a sinister religious cult. This ruined church has become a place of worship for the cult, and is only accessible by boat. Vehicles are a new addition to Exodus, including creaky wooden rowboats that the local mutated prawns seem to have a ravenous appetite for. Whether it's cultists or monstrous crustaceans, the Volga is full of things that want you dead. But there are some friendly survivors too. As you explore the wasteland in Exodus you'll often discover buildings from the old world reappropriated as shelters or camps. This gas station will never pump another drop, but some enterprising bandits have turned it into a makeshift hideout. You can ignore them and mind your own business, but they might be protecting something valuable you can scavenge. These are humanimals, a new type of mutant in Metro Exodus. Venture into their territory and they'll crawl out of the darkness and attack in packs. They might have been human once, but years of exposure to radiation has rendered them feral and aggressive. A well-placed headshot will make short work of these ghouls, but they can overwhelm you if you aren't careful. There's a lot to discover in Exodus if you venture off the beaten path. While exploring the swollen banks of the Volga I found this plane wreck, which presumably crashed when the bombs fell. Inside I find the pilot, now a grimacing skeleton, still at the controls. The artists at 4A Games really do have a knack for creating haunting post-apocalyptic imagery. In another example of things being reappropriated by survivors, the shell of the crashed plane has been turned into a cosy little camp. I see a fire and clothes hanging up to dry, although the dead body nearby suggests the tenant was killed by one of those hungry crustaceans. It's attention to detail like this that makes exploring the world in Exodus so rewarding. Here you can see an ominous storm rolling in. The weather around the Volga is unpredictable, and a few minutes after taking this screenshot I was swept up in a violent thunderstorm. The weather effects are pretty incredible, with driving rain, cracks of lightning, and howling wind that almost makes you feel cold. If you want the storm to pass, you can rest at a campsite. While exploring you'll often discover evocative traces of the old world. I found this house in a flooded village, and there was something quietly haunting about the photo of a man pinned to the wall. I mean, it's probably just one of the developers, but in my head it was the son of whoever lived in this shack before nuclear fire rained mercilessly from the skies. Some more reminders of the world before the bombs fell, this time in the form of old religious icons. The cult Artyom encounters seems to follow some aspects of Christianity, but also has its own beliefs: namely that all technology is evil and cursed. And in a world left devastated by the most terrible technology of all, nuclear weapons, can you really blame them? Most of the electricity pylons around the Volga have collapsed into rusty, twisted heaps, but this one is still standing—and, of course, the bandits have turned it into a stronghold. This is one of many optional, ambient missions to complete in Exodus, usually earning you some decent gear in the process. And when you're done you can take the zipline back down. This is the reason Artyom and his friends are stuck in the Volga. The only bridge out of the region has been transformed into a massive, intimidating fortress by the cultists. Get too close and the guards on the jagged metal ramparts will kill you. After two games spent mostly underground, seeing structures like this in a Metro game is pretty wild and unexpected. Here's the bridge fortress from much further away, which gives you a sense of just how colossal it is. You can also see a factory in the distance, which Artyom visits during a story mission. In the foreground you can see remnants of a village that flooded long ago. The world-building in Exodus really is remarkable, and it's one of the most grimly immersive worlds on PC. A large, busy port once existed in this part of the Volga, although most of it has either been destroyed, taken over by mutants, or pulled into the mud. This shipwreck is a clue to the region's seafaring past, as well as the many shipping containers and rusted cranes that litter the area. You can see the fortress here too, which is always looming on the horizon. The Volga is one of several locations in Exodus, all of which have a unique look and feel. After the Volga the Aurora makes its way to the dried-out Caspian Sea, which features a desert climate and some equally strong world-building. I didn't love everything about Exodus, but this post-apocalyptic road trip is one of the most memorable journeys I've taken in a game in some time.